After a quick recap of the previous issues, we catch up with T’Challa duking it out with a pair of highly armed – and similarly garbed – pursuers. Through a high-octane action sequence, we learn that these are the Hatut Zeraze (which translates to “Dogs of War”), members of a now-defunct Wakandan Secret Police. This sequence contributes to issue four being the most action-packed segment of the story thus-far. Writer Priest and artist Texeira work together great here, with a kinetic sequence punctuated by Ross’ narrative explanations. There’s great ebb and flow here; in one panel we see the two soldiers become invisible. In the next we learn that T’Challa’s mask is fitted with technology that allows him to see them, which only reveals that there are three more soldiers waiting for him. After deftly dispatching his opponents, T’Challa calls for their master, an enigmatic man named Hunter and titled The White Wolf. Hunter repeatedly refers to T’Challa as “My King,” but one can tell from T’Challa’s dialogue that there is some ill-will between them. An immediate detail that sticks out about Hunter is his skin color. Hunter is Caucasian, eerily reminiscent of Clark Gable’s Rhett Butler in Gone With the Wind. He speaks and moves with a poise that has only been matched by T’Challa thus-far in the series, and it becomes apparent that these two men have a storied history together. At one point, Hunter refers to T’Challa as “the king’s son,” a point T’Challa is quick to correct him on. T’Challa is king, and it is revealed that he is the one who disbanded the Hatut Zeraze after his father’s rule. After Hunter offers one last taunt, picking at T’Challa’s past, the reader gets a quick aside where Richmond, Jaime’s killer, comes to the door of Sgt. Tork, the cop who arrested T’Challa and his companions earlier in the story. This is a humorous conclusion to that narrative end, with T’Challa delivering an appropriate comeuppance to both characters for their misdeeds, real and perceived. Ross quickly cuts the story short, and the reader sees him in the present in Nikki’s apartment. He playfully tries to get Nikki to drop the conversation and join him in bed, but Nikki calls him on his avoidance. Thrust back into the narrative, Ross is now knee deep in pants, suggesting he did not give up in trying to remove himself from Mephisto’s grasp. 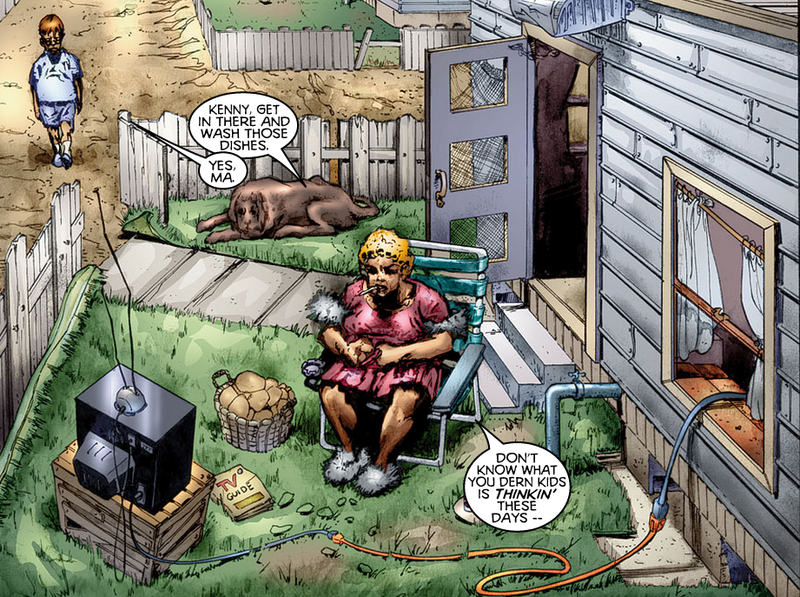 In their conversation, Mephisto reveals certain aspects of his powers, namely that he and his realm are one, suggesting that there is a scientific angle to his powers. What results of their conversation is yet another flashback, where the reader discovers Ross’ home life was not ideal. These flashbacks perform well in making Ross more sympathetic. Prior to this, Ross has seemed to always be a bit insecure and self-deprecating. While these scenes don’t necessarily change that perception, they do show the reader that these character flaws are deeply rooted in Ross’ childhood experiences, and serve as a nice contrast to the royal childhood that T’Challa experienced. As Ross is trembling at Mephisto’s mind games, T’Challa comes in and does something incredible in its simplicity: he punches Mephisto. In a brilliant reveal, the reader learns that the giant entourage that greeted Ross at the airport in issue two were, in fact, some of Wakanda’s greatest scientists. They had been monitoring Mephisto and the energies he channeled. Upon discovering the way Mephisto’s powers worked, they were able to devise a way to block them, leaving him vulnerable for Black Panther to pounce. Once again, this is a sequence that serves multiple purposes. One, it gives T’Challa a victory over an established Marvel supervillain. Mephisto was often pitted against better known heroes such as Thor, Silver Surfer, and Ghost Rider. 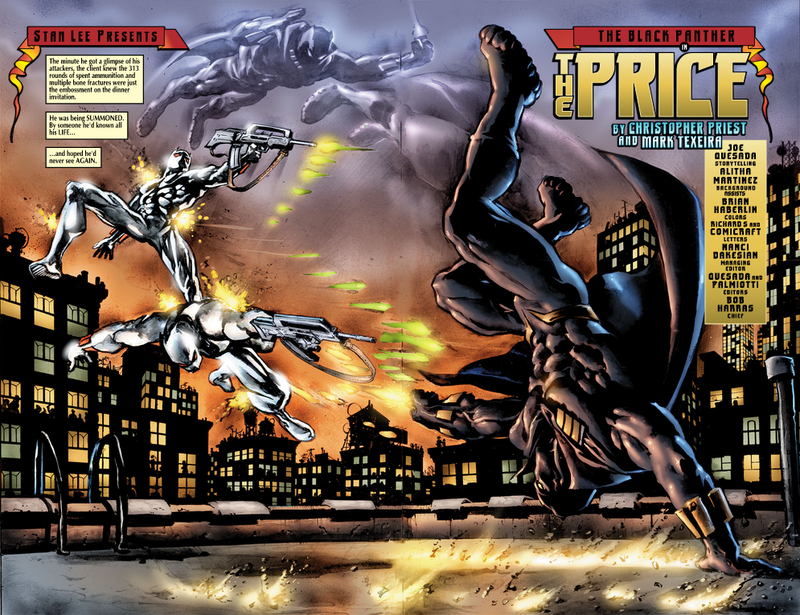 By giving T’Challa a victory over him, Priest is demonstrating T’Challa’s effectiveness as a superhero, something that the comic book readership had consistently challenged at this point in time. This is driven home by the fact that T’Challa brutally removes Mephisto’s heart. At the same time, it is the first real reveal of a trait that would define T’Challa in this run: his preparedness. That T’Challa even has this many scientists on his investigation with him suggests that he was at least partially aware of Achebe’s plans. It’s a very subtle detail that hints at a mind that is constantly focused on the bigger picture. 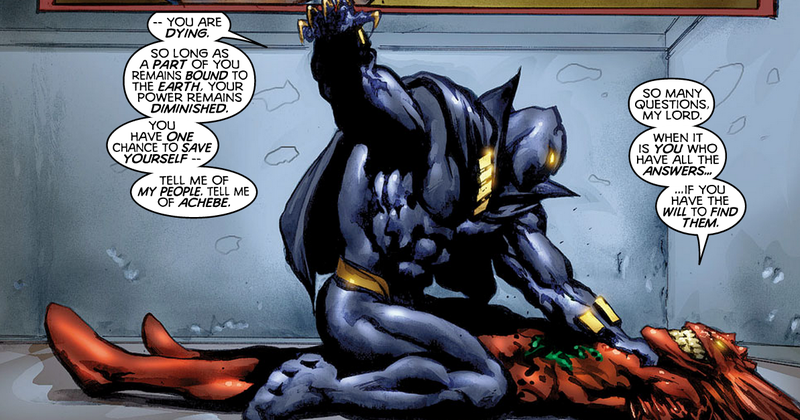 Unfortunately for that mind, Mephisto has one last trick up his sleeve: dragging T’Challa into his realm.